The Photron FASTCAM Mini AX100 and Mini AX50 high-speed cameras provide high frame rates, extraordinary light sensitivity and superior image quality in a compact, lightweight and high-G camera design. Providing 1,024 x 1,024 pixel resolution at up to 4,000 frames per second (fps) and reduced resolutions to 540,000 fps, the Mini AX100 and Mini AX50 deliver the performance required for demanding industrial, military and laboratory applications. With light sensitivity of ISO 40,000 monochrome and ISO 16,000 color (using the ISO 12232 Ssat standard), the FASTCAM Mini AX100 and Mini AX50 have better sensitivity than other mid-range high-speed cameras. Higher light sensitivity means that less additional lighting is required to capture a high-speed event. It also means that faster frame rates, shorter shutter speeds and greater depths of field are provided under equivalent lighting conditions. 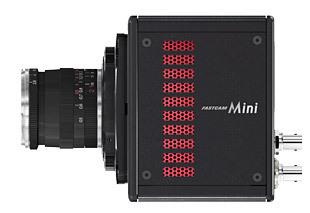 Contained within a 120mm x 120mm x 94mm camera body weighing just 1.5kg, the FASTCAM Mini AX100 and Mini AX50 are uniquely suited for use in a wide range of applications. The cameras are designed for operation in high shock and vibration environments, allowing them to be utilized in automotive crash test facilities and on military test ranges. The FASTCAM Mini AX100 and Mini AX50 are identical with a single exception. The Mini AX100 is the faster camera, providing 4,000 fps at full resolution. The lower priced Mini AX50 allows 2,000 frames per second at full resolution.